New Albany, a city, port of delivery, and the capital of Floyd co., Indiana, on the Ohio river, 2 m. below the falls, and opposite the W. end of Louisville, Kv., 100 m. S. of Indianapolis; pop. in 1850, 8,181; in 1860, 12,647; in 1870, 15,396; in 1874, according to local authorities, 22,246. It is finely situated, with wide streets, at right angles, upon two benches or plains that sweep N. by a gentle rise from the river. To the west and northwest is a range of hills from 300 to 500 ft. in height, called the Knobs. The chief public buildings are the court house, erected at a cost of $140,000; a fine city hall; the opera house, costing $100,000 and capable of accommodating 2,500; the masonic and odd fellows' halls; three large hotels; the railroad depot; and 10 large public school buildings. The fair grounds in the N. E. suburb comprise 72 acres, and contain a race course and appropriate buildings. There are four cemeteries in the vicinity of the city, one of them national. The railroads now in operation that terminate at New Albany are the Louisville, New Albany, and Chicago, the Jeffersonville, Madison, and Indianapolis, and the Louisville and New Albany, the last passing over the bridge at the falls. 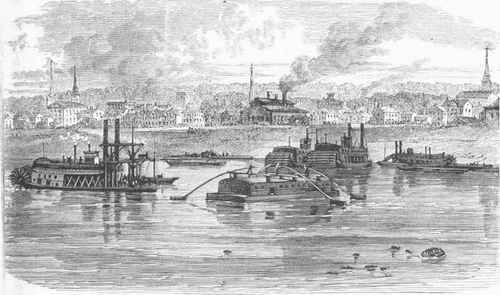 A steam ferry plies between the city and the W. end of Louisville, and a bridge across the Ohio at this point is projected. The Ohio river, within a distance, of two miles above New Albany, has a fall of 29 ft., affording the finest water power in the west. The river trade amounts to from $15,000,000 to $20,000,000 a year. A large wholesale business is carried on. Manufacturing is the most important interest of the city, embracing 142 large establishments, which in 1873 employed 3,681 hands and a capital of $7,947,500, and produced goods to the value of $24,486,574. Cottons, woollens, glass, machinery, and iron, brass, and wood work of all kinds, are produced. The works of the star glass company with their buildings and necessary grounds cover 15 acres; they are the most extensive glass works in the United States, and the only ones producing polished plate glass. There are two large pork-packing establishments, and six banks (three national), with an aggregate capital of $1,500,000. - New Albany is divided into six wards, and is governed by a mayor and a common council of two members from each ward. It has an excellent fire department, two public market houses, a street railroad, and is lighted with gas. The assessed value of property is $10,000,000, about a third of the real value. The public schools are graded and embrace 53 departments, including high schools for both sexes. De Pauw female college (Methodist) was organized in 846 and chartered in 1866. In 1873-'4 it hd 6 instructors, 101 students, and a library of 1,000 volumes. A newspaper with daily and weekly editions is published. There are 30 churches, viz. : 3 Baptist, 1 Christian, 2 Epis-opal, 2 Lutheran, 13 Methodist, 5 Presbyte-ian, 2 Roman Catholic, 1 United Brethren, and Universalis. - New Albany was laid out in 813, and was incorporated as a city in 1839.